“I want to build something,” Henry says. And that’s exactly when I realized Warhorse Studios had me figured out. They know that when it comes to me and role-playing games, building a character is good but building a home can be great. Especially if you’re not just building a house, but building the butcher, the baker, and the candlestick maker, too. Yes, you get to build a home of sorts, but you also get to raise a village. 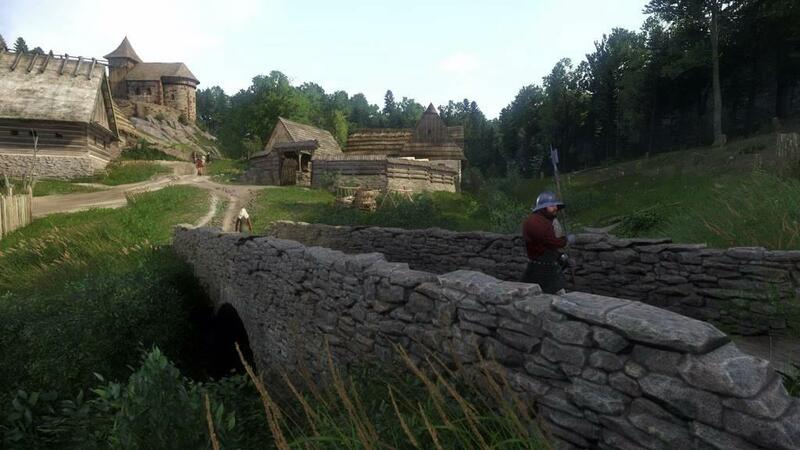 From the Ashes is the first expansion from Kingdom Come: Deliverance—the no-magic, no-nonsense historical RPG taking place in a heavily researched and reconstructed patch of 16th century central Europe. From the Ashes is playable after completing the Baptism of Fire mission, which is about 14 quests into the campaign, and is meant to interweave into the main story. Now that you’ve driven out the bandits that had set up camp there, Sir Divish, the big dog of this entire region, assigns you the role and responsibilities of bailiff for the village of Pribyslavitz. That’s the old ruined township at the northernmost edge of the map. If you’ve indeed completed the Baptism of Fire mission, you’ll recognize it as the place you helped conduct a major raid upon some heavily embedded bandits. You’ll also remember that the upper room of the church here is where you had your fateful showdown with Runt, the bandit leader that took a rather sizeable club to the side of your head in the game’s opening chapter. That encounter ended on an intentionally unsatisfying note. So here we are. The storyline just informed us that there’s a power behind the power, as tales of revenge often do, but From the Ashes sidebars the vengeance for a story of reclaiming and rebuilding. Pribyslavitz was Sir Divish’s old stomping grounds. Judging by the small but solidly built chapel, the whole place used to be a reasonably sized village. It doesn’t look that way at first, though. The forest around Pribyslavitz has consumed it. Nature has reclaimed almost all of what was once here. A healthy but overgrown mix of pine and deciduous trees grew up, around, and through the few ramshackle buildings that are left. But Sir Divish thinks it’s high time the place was given a second chance. Unfortunately, he’s rather busy and has all of his time and resources committed elsewhere in the realm. Which means it’s up to you, Henry of Skalitz, to make it happen. But you're not alone. You'll work with Sir Divish’s urban renewal planner, Marius, an unerringly respectful man that knows how to rock a chaperone hat like nobody’s business. This expansion sits somewhere between Skyrim’s Hearthfire expansion and the life-of-a-woodsman survival sim The Forest. You don’t pick which building goes where on a blank plot of SimCity land. You don't decorate the place room by room. Rather, you manage the accounting and logistics for the reconstruction of the village. You pick when to refurbish the village church. You decide between building a butcher or a baker, but strangely not both. You decide between horse stables or a guardhouse, but again, strangely not both. You get building materials flowing into Pribyslavitz. And after the woodcutter’s camp is established, your main duty is to turn the town into a moneymaker as soon as possible. The expenses for maintaining a town hall—let alone the expenses for getting the house of God back on its feet—drains the coffers daily. It’s your job to foot the expenses out-of-pocket, so you’ll want to build structures that put your accounting books back in the black. Rebuilding Pribyslavitz is no get-rich-quick scheme. But making it so the treasury has more assets than liabilities is job one. I’d like to say I didn’t sweat that part, but I was sweating it. The added stressors fundamentally changed the way I was playing Kingdom Come. Before this expansion, my gameplay was a slow burn, from sunup to sunset. I took leisurely rides out in the countryside. I strolled through the town at the speed of a noble with nowhere to go. I’d pick up an odd job here or there, and more likely than not, not worry too much about deadlines. But not anymore. From the Ashes changed all that. Suddenly, I was motivated. 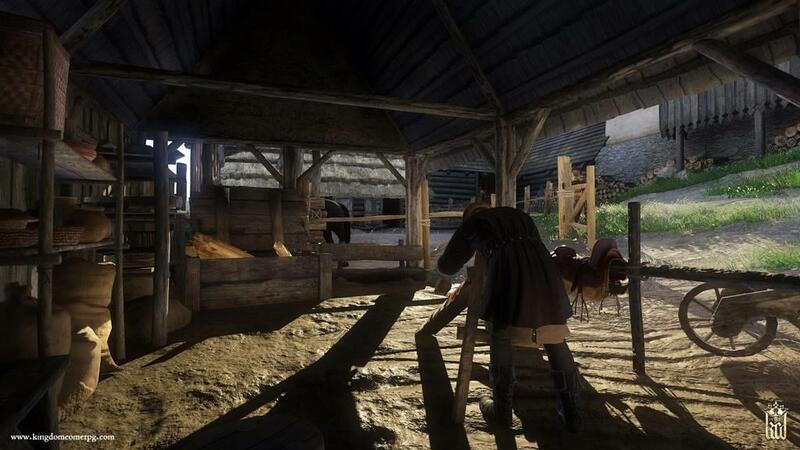 A stream of old Skalitz refugees began filtering into my town, and I wanted to ensure that every single one of them had a full belly, meaningful work, and a place to lay their head. A lot of folks coming into my town were poor but hardy folk, willing to work hard, and not too worried if, at first, they had nowhere to sleep but under a lean-to under an open sky. I couldn’t leave them like that, though. So I took to my appointment as bailiff with a vigor I hadn’t experienced before in Kingdom Come. My base of operations was the temporary town hall at the top of the hill. Starting out, it’s nothing more than a couple tents, a couple chests, and an accounting book setting on a podium. This is where I’d find Sir Divish’s urban renewal planner guy, Marius. I’d come into Pribyslavitz, throw some coin into the coffer, flip through the planner book, then tell Marius what I wanted to build next. Ever the professional, Marius would give a cursory glance over the books to make sure we were economically solvent and that we had the requisite building materials on hand. He’d even jog over to the building site, just to give me one final look-see before the building went up. He’d ask, You ready? I’d say, I’m ready. Then the screen would go black with a caption up that says: A few days later. I’d hear the sound of hammers and saws, the lights would come back up, and behold, new building. There’s a quick cutscene of citizens going to work, whether it’s forking hay, hauling buckets of water, or butchering carcasses. Then, with that building now online, the accounting book was updated, and I’d then be further in the red (losing money) or closer to getting back in the black (making money). I couldn’t play an entire game just of this business management sim. But it feels very good here within Kingdom Come. Every invading Cuman, every black-clad bandit, every highway robber became a valuable source of income for the rebuilding project. I began to eliminate enemies with extreme prejudice. The entire town of Pribyslavitz, for me, was built upon the principle of me stripping every bad guy down to their long underwear and selling every last shoe, shirt, and length of hosiery to all the blacksmiths, tailors, and traders across the land. There was a war to reestablish my village, and that war was me, riding headlong into enemy encampments, then slicing and dicing my way to plunder and profit. 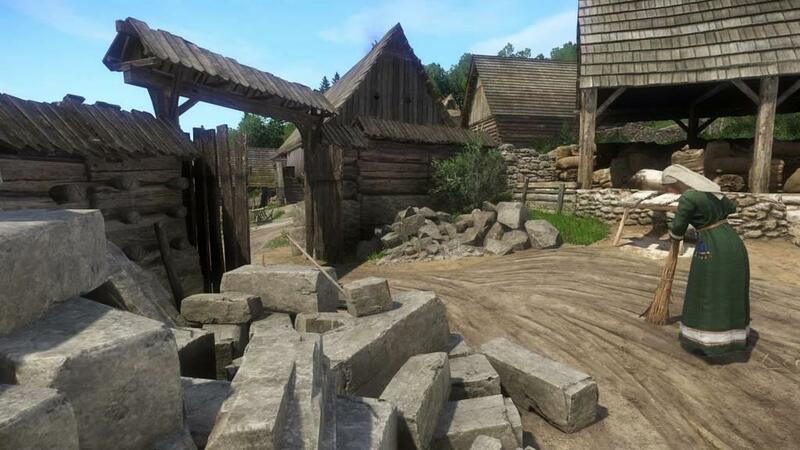 The bandit camps in the center of Kingdom Come built my blacksmith and stables. The Cumans up in the silver mines around Skalitz got me a shiny new tavern and a butcher. Random groups of bad guys attacking me in the woods spilled every drop of blood necessary to build up my town hall and to pay for the shipments of stone I needed to finally get that lovely little church back into operation. I enjoyed every minute of building that town. I know its roads more intimately even than Ratay where I’d spent most of my hours before From the Ashes. Pribyslavitz’s location is a well-placed haven, since the rest of the north is filled with highly skilled and well-armed bandits. And even though it’s almost guaranteed I’ll get jumped both coming and going, I’ve become highly skilled and well-armed myself in this amount of time. Plus I’ve got tradesman there with pockets that grow deeper every day. Oh, and my fully rebuilt town now makes me a steady income. The tavern, the blacksmith, the butcher, etc., these are profitable businesses that pay their tithe to me, their bailiff. I will never hesitate in an RPG if there’s opportunity to build something. Armor and weapons are great. Stats and abilities are great. But if I can alter the landscape in some meaningful way, if I can have a little business simulator to go along with my medieval role-playing game, then I’m very happy. I only have to wonder at the underwhelming conclusion of From the Ashes. Not that Sir Divish isn’t thankful for what I’ve done. He is. And it’s not that the townsfolk don’t greet me happily. They do. But after I came down from the high of rebuilding the entirety of Pribyslavitz, I can't help but want more; especially when trying to decipher what Sir Divish means when he says that he has plans for further expansion. Further expansion? There’s nothing left in my quest book that points me to further expansion-like adventures. For now, however, it’s been worthwhile to bring a long-lost village up from the ashes.